In the heart of the Tenderloin are two oases, safe places of community and health care. These are SteppingStone’s Presentation Adult Day Health Center at 301 Ellis Street and the Golden Gate Adult Day Health Center at 350 Golden Gate Avenue. SteppingStone’s roots in the Tenderloin are deep. 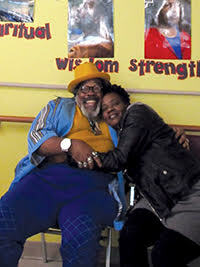 The agency was born in the Tenderloin in 1983 on 333 Turk Street in the back room of The North of Market Senior Services that was to become the Curry Senior Center. The mission then, as now, was to help frail elders and adults with disabilities maintain their health and independence. Like all SteppingStone ADHC Centers they offered a wide range of services including physical therapy, occupational therapy, social work services, personal care, skilled nursing, recreational activities, door-to-door transportation and a hot lunch. In the early days, the organization’s name was North and South of Market Adult Day Health and occupied several locations over the decades including Turk Street, Geary Street, Jones Street and now Ellis Street and Golden Gate Avenue. John Tinloy, now SteppingStone’s Director of Programs and Outreach, was first hired in 1987 as a Social Worker at the Geary Street location. During his lengthy career at SteppingStone John served as the Program Director for the Presentation, Mabini and Mission Creek Centers. The Golden Gate Center was built to be co-located in the Madonna Residence housing at 350 Golden Gate in 2000. It currently has 53 participants some of who have been with program nineteen years. It has 14 staff some of who have been with the Center for over a decade. Besides the many therapeutic activities at the Center Golden Gate, participants enjoy music therapy and field trips, most recently to COSTCO. Presentation Center opened in 2001 within the Mercy Housing complex and is located next to Glide Memorial Church. It takes its name from the Presentation School that once occupied the site. John Tinloy was the first Program Director, a position now held by Nicole Clause, who in 2001 was the Center’s Activity Coordinator. Besides Nicole, two other staff members have been with the Center since it opened (Karen Lee and Monvipa San Pietro) and another six have worked there for over a decade. Overall Presentation has seventeen staff members serving seventy-five participants. 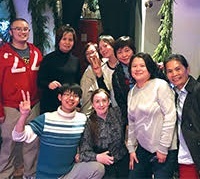 Five of the Center’s participants began attending in 2001 and one current participant has been with the program since opening day nearly 18 years ago. Presentation has many activities, all conducted in both Cantonese and English. These include a choral group made up of participants, the Rainbow Choir. The Center prides itself on special events, some for holidays and others created just for the enjoyment of participants. There is also an excellent music therapy program. In the short time I’ve the pleasure of serving as SteppingStone’s executive director, I’ve come to realize how fortunate I am to lead such a committed team of professionals fulfilling such a vital mission. 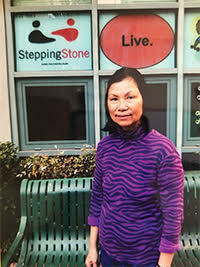 SteppingStone’s desire and obligation to help chronically ill seniors and adults with disabilities who have been marginalized by numerous factors fills an essential community need supporting San Francisco’s senior population to age in place. 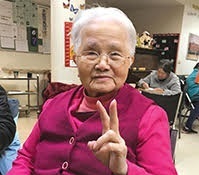 Our work allows seniors to maintain their physical and emotional health and it reduces their fears of isolation and loneliness by connecting daily with our centers communities. We like to say, “Our seniors come for the health and stay for the community.” These are communities that are vibrant, multi-cultural, nourishing, engaging, and comforting. Which brings me to our staff. a constructive and upbeat client experience. Not only are they effective and efficient in their daily routines, our staff are flexible in their approach to new initiatives and therapies. Our staff have embraced recent cultural competency trainings, evidence-based care approaches such as trauma-informed care, music therapy sessions, and a body dynamics class that engages our elders and adults with disabilities with a unique approach to exercise, just to name a few. Their work with the homeless, veteran’s, and the LGBTQ populations portends employing distinct methodologies to break down barriers and provide supportive and thoughtful attention. This kind of suppleness helps create an inclusive environment for clients of all ethnicities, races, gender-identities, and disabilities to become a part of and share. All of which makes SteppingStone a thriving, healthy community we can be proud of.